Former England manager Sir Bobby Robson has launched a charitable foundation to help in the fight against cancer. Sir Bobby, 75, who is battling the disease for the fifth time after first being diagnosed in 1991, aims to raise £500,000 for the new charity. 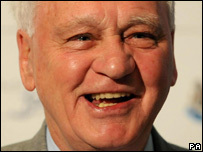 The cash will fund the Sir Bobby Robson Cancer Trial and Research Centre, being built at Newcastle's Freeman Hospital. The centre will focus on early detection and treatment and clinical trials of new drugs. Speaking at the launch Sir Bobby said: "I have had cancer five times now but I have had a wonderful life and I feel lucky to be alive. "I owe my life to the people who have cared for me and treated me during the last 15 years in which I have had the disease. "I think I might be remembered for what I did in football. But the legacy I would like to leave behind is what I tried to do to help people with cancer live longer." The research centre will also boast dedicated research facilities, including a 12-bed unit with treatment rooms, a laboratory and consulting suites. Celebrities, including former Arsenal goalkeeper Bob Wilson and television presenters Des Lynham and Jim Rosenthal, joined Sir Bobby at the launch event on Tuesday. Last year doctors discovered the former Newcastle United manager, who lives in County Durham, had small cancerous nodules in his lungs. He has battled the disease on and off for the past 15 years, having undergone cancer surgery four times.